It’s been just over 30 years since water levels were high like they are today, so how has the bass fishing been? As is always the case, select areas are holding good numbers of smallmouth, but overall, spots that we have come to depend on haven’t been as strong. The rapid change in water levels can explain some of this, but there may be more to it than that. The first move I made as the waters began to get closer to 1986 levels was to revisit old spots that produced back-in-the-day. To my surprise, this was a bust. It did remind me though of the days when we saw the water levels fall. Bass would hold on to a spot year after year, even though the depth they had to work with was vanishing. They finally moved off some of the shallower spots once they became dry land. 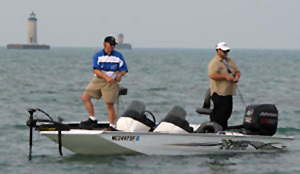 Captain Wayne Carpenter and Frank Keller fish a shallow Lake St. Clair flat. Could the reverse be happening now? Are bass holding on to established spots, waiting to make a move? That may be the case, but it can’t be proved with the bite. Established spots haven’t panned out either. For better or for worse, this is the New Lake St. Clair. The ecosystem has become transformed since the last high water period into something completely different. Heavily stained water – gone, sculpin – gone, gobies invaded and are now in decline, zebra mussels invaded and quagga mussels now dominate. Northern Pike used to be thick as thieves as they made off with our bass baits, now they turn up from time-to-time. Musky prowl deep and shallow and the once mighty alewife have all but disappeared. None of that is bad news. However, we are presented with different elements to deal with. Few anglers would trade days of potential five to six-pound smallmouth for the 2 ½ lb. averages that we used to catch. Part of the fun in bass fishing is to solve the puzzle, figure out what spots, baits and presentations are the most effective, then work those patterns. My guide customers have not left the Lake disappointed after a day of catching fewer, but bigger smallies. 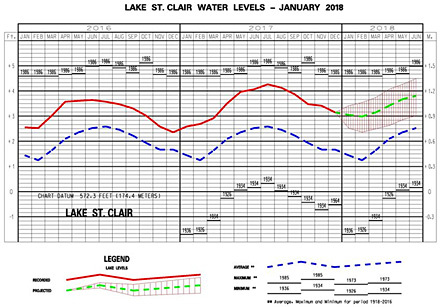 For 2018, the U.S. Army Corps of Engineers graph shows us historical data saying we could be in for higher water in 2018 and 2019 yet. In 2018 the U.S. Army Corps of Engineers is showing us through historical data that we could be in for higher water yet. My recommendation then would be to keep an open mind on the water and follow the bite as it presents itself. I have a chapter in my new book, No Secrets on Lake St. Clair Volume 4 that gives you tips for fishing zones that can hold up under high water conditions. That is a good place to start. If you have that and keep up with the updates on stclairreport.com, you should have a great smallmouth bass fishing season in 2018. This article was written January 29, 2018.